Everyone wishes for a special guardian angel and they should be invited to any occasion where love and happiness abound! Angels watching over you and your guests are sure to bring a warm and joyous feeling to any occasion. 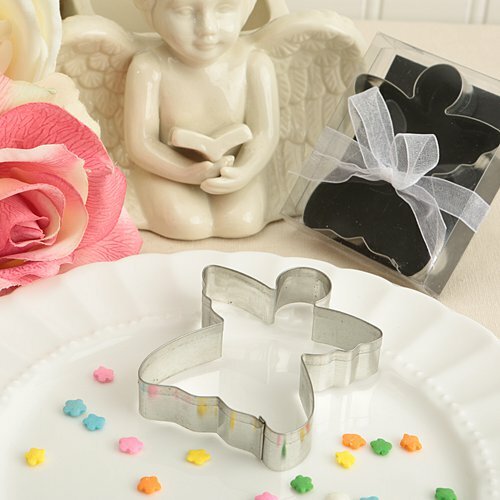 This beautiful cookie cutter will turn out an abundance of angel cookies, enough for everyone and some to spare. Whether you are planning a wedding, baby shower, birthday party, christening or other religious event, your guests will be over the moon to receive a gift box with one of these heavenly cutters. At Fashioncraft, we understand that your guests love favors which are both pretty and useful and what could be more perfect than the special blessing and love of an angel! This divine favor will give your guests many special and wonderful moments to remember when they bake and decorate scrumptiously delicious guardian angels!